There has been a delay as I have not had internet strong enough to see or work on the Beetrax site. After more than a year of planning and preparation, the day to enter China arrived. 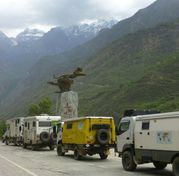 We crossed the border at Mohan in Yunnan Province, drove the trucks through a water spray which wet the lower part of the trucks, parked them and then walked into the Immigration Hall to have our visas checked and passports stamped. All very efficient and modern. Our guide, which we are required to have to drive our own vehicle through China met us in the Immigration Hall. He will be with us whenever we are driving the trucks. 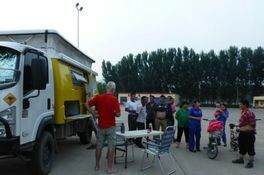 Next stop is the traffic police in the town of Mengla about 50 kms away to have the trucks and us registered to drive in China. 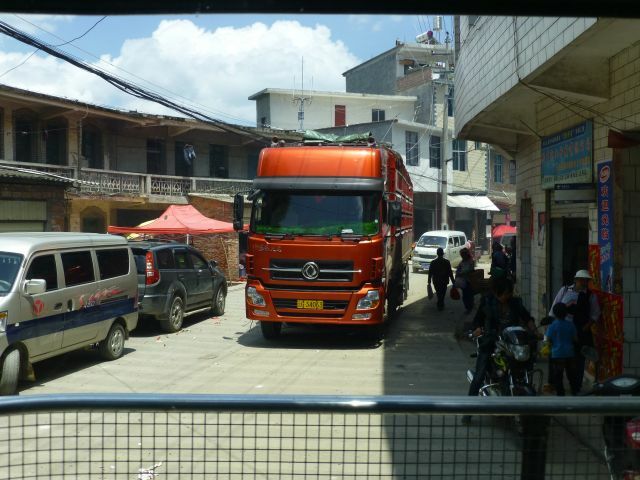 After lunch, the trucks are inspected and we receive a laminated registration plate for each truck, registration paper and driving licences for us in China valid until 31 July. 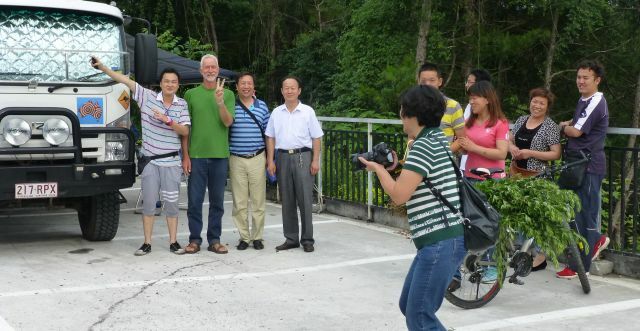 We continued driving to Menglun where we camped next to a stream in the carpark for The Tropical Plant Gardens. 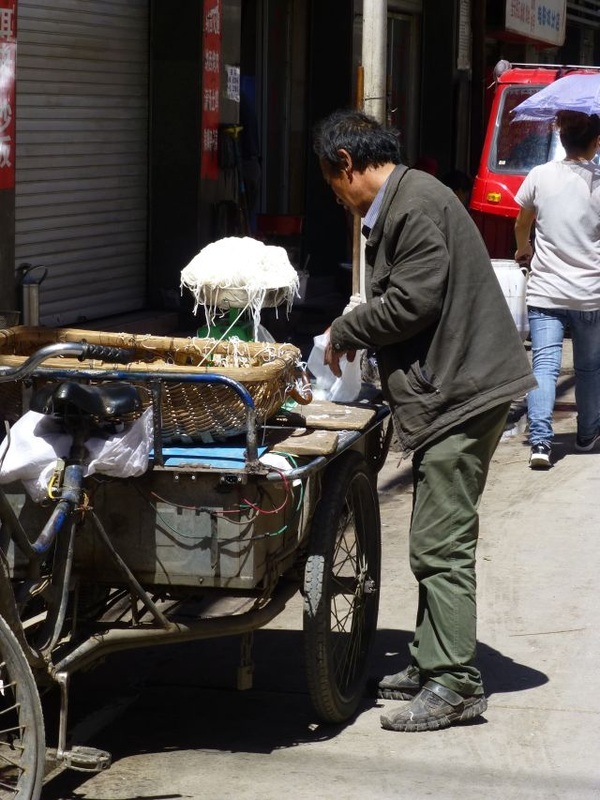 Introduction to Chinese traffic.....as chaotic as everywhere else! 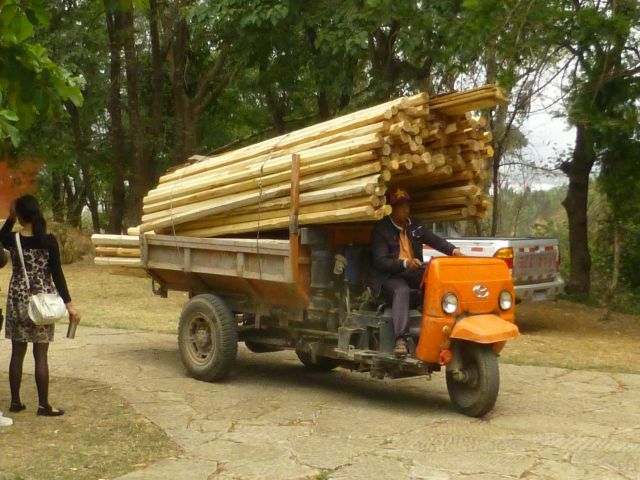 We saw masses of rubber trees contoured around the mountains and some impressive roadwork. We spent the morning walking and being driven in cart through the massive botanical gardens. Even so we only saw a small part of it. 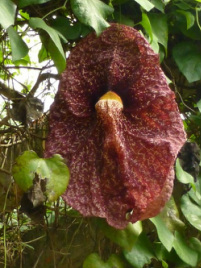 Although mostly in Chinese the botanical names were also written in English. Next stop Jinghong where we camped in a carpark between a busy road and a night market area. Thankfully it rained. Fortunately we can still sleep with the roof on the truck down. This is very handy if it is cold or noisy. Jon and Jude and their rooftop tent the Taj Mahal. 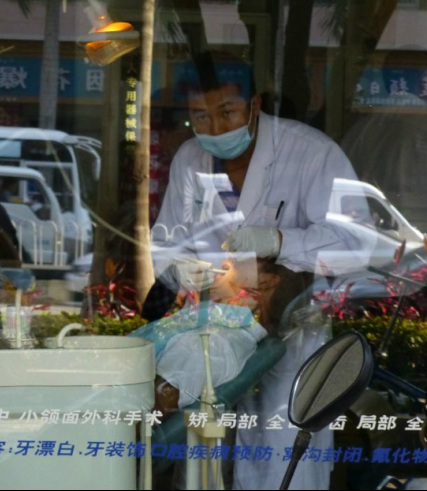 Many dentists display their work in their shopfront. 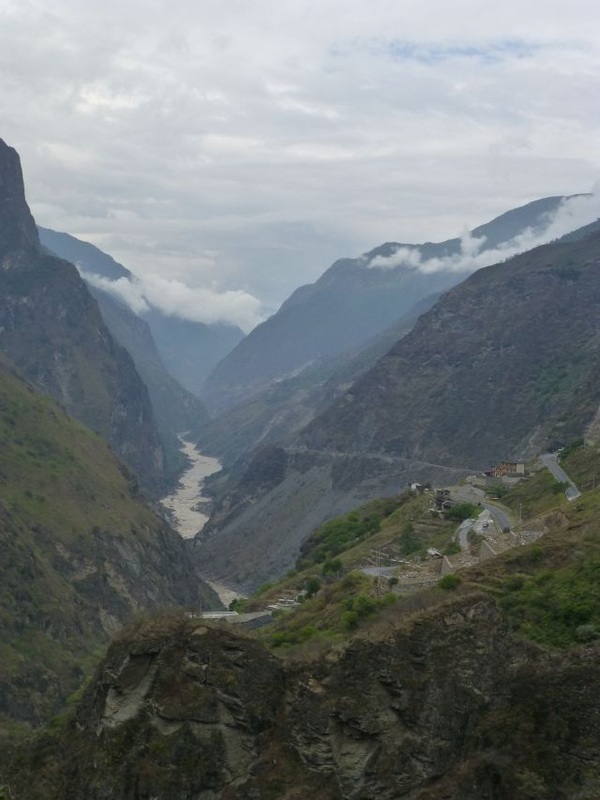 A day of driving through southern Yunnan province to Jiangcheng. While setting up camp villagers come from nowhere to watch. 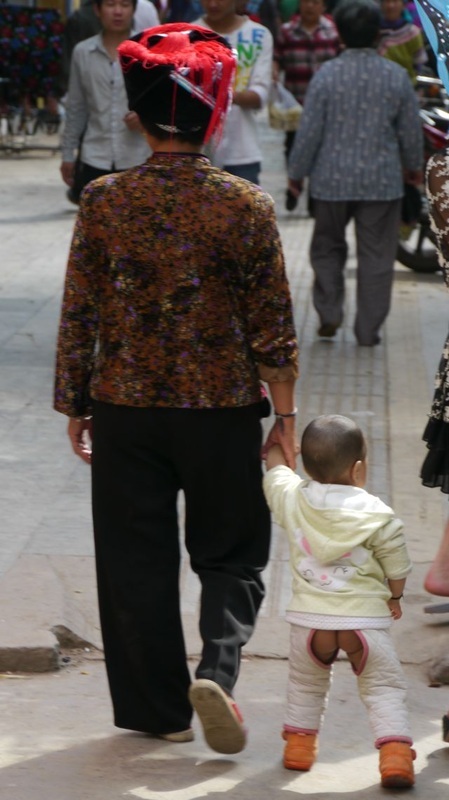 One of the spectators was a young woman with a 7 month old son who later invited me into her home. 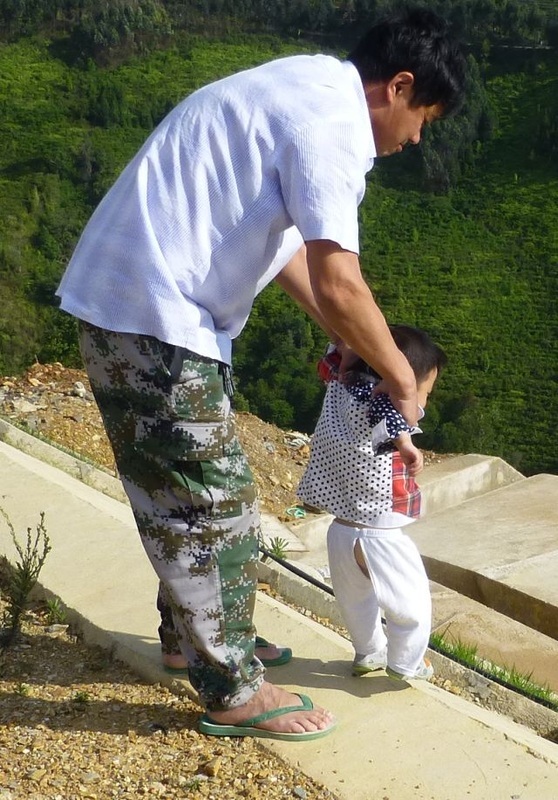 This is where I first saw the pants that are used before a child is toilet trained. The seams are not sewn from above the knees to just below the waist. 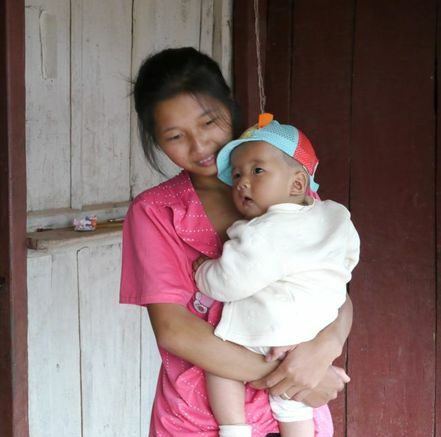 Young mum with 7 month old son. 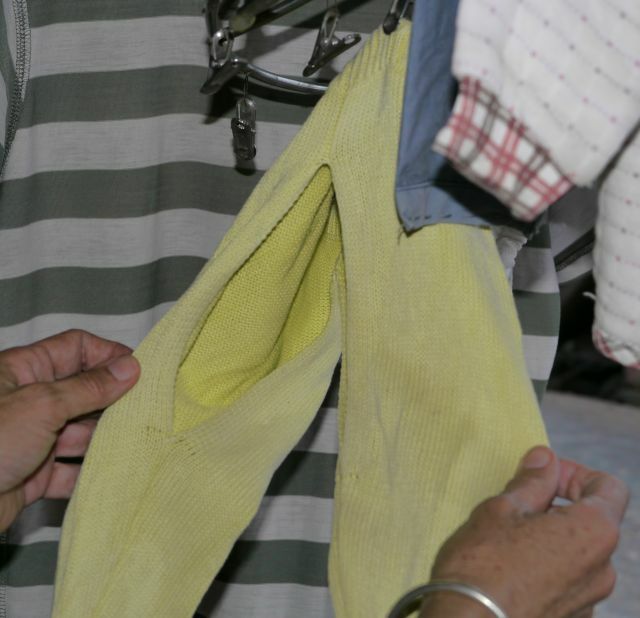 Those 'quick-release' pants for toilet training. Ready to whip up those knees and allow the pants to part if required. A little exaggerated, but you get the idea! 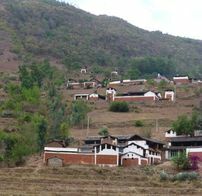 A long day driving through very mountainous countryside passing many people in colourful traditional dress to go to town. General market day I think. 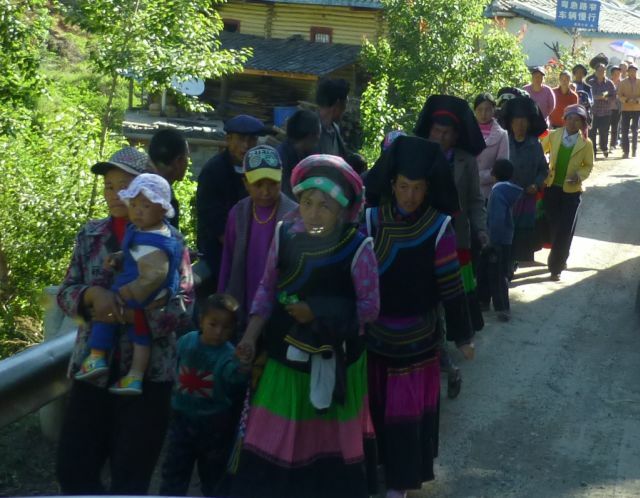 Good scenery and colourful people on our way to Lichuan. An interesting campsite which was a building site overlooking where a huge hill is slowly being beavered away to fill up a valley and so make a large building area. We drove onto the famous rice terraces you see on the calenders near Yuangyang. Fantastic! I could have spent days driving around the circuit gazing at them. The rice fields are first ploughed using water buffaloes then planted intensively in 'nurseries' (the bright green areas) and then pulled out and tied together in bundles when it is about 30 cms high. It is then planted out in incredibly straight lines (lighter green areas). 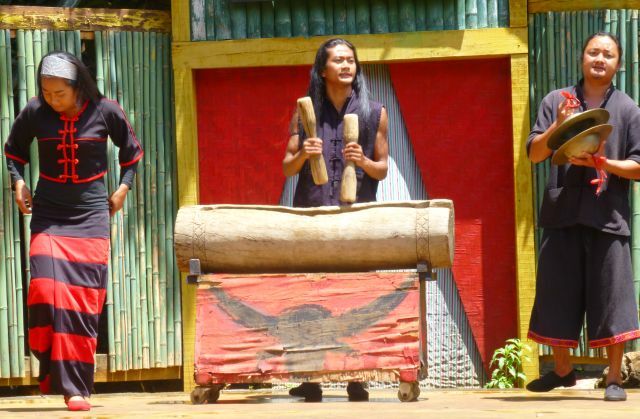 To add to the attraction and colour the local Hani people wear their traditional dress. 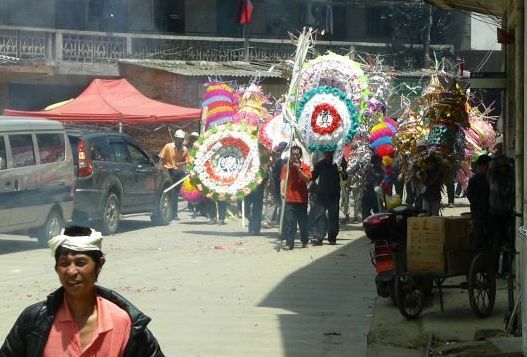 While shimmying through the narrow streets of one of the villages we found ourselves in the middle of a funeral. 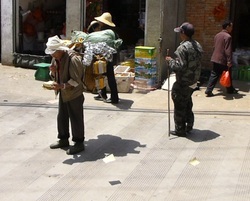 A man walks in the front throwing paper on the ground (buying the road), then a tuk tuk came with a person on the back throwing masses of crackers down on the road, followed by men carrying brightly decorated poles, then walking behind them were men in white headdress and clothing, men blowing trumpets, friends and family then another tuk tuk with a man throwing more crackers down on the road. 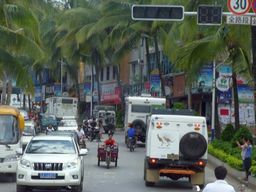 It always requires careful driving when going through a village as there seems to be no limit to the size of vehicles or animals also using the road. After the funeral it was very slow. 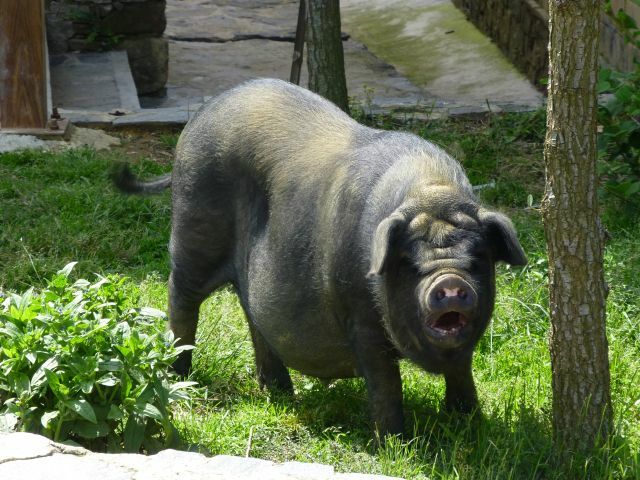 Does this pig have eyes? 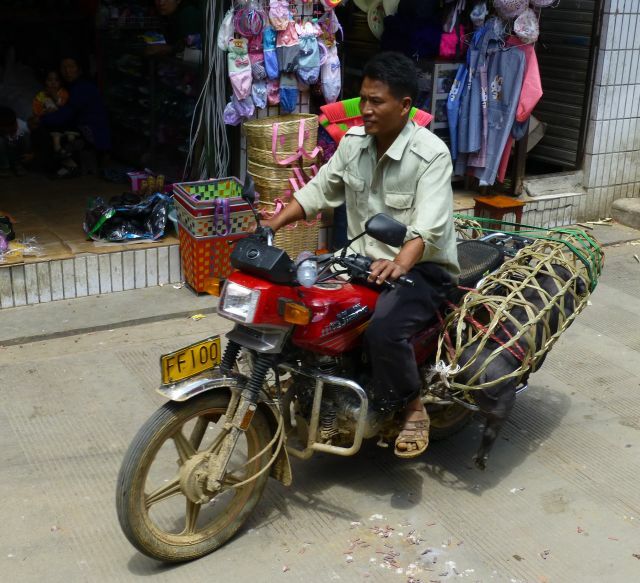 Pig for dinner - see the leg hanging out of the basket? Great reflection of dam gates. 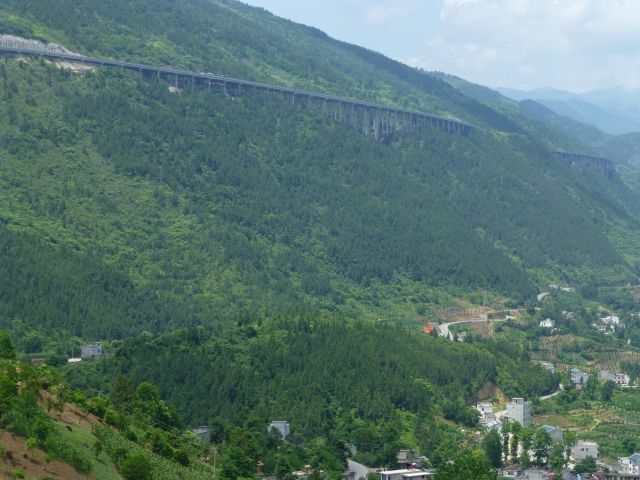 A lot of driving on narrow mountain roads to Jianshui. Lots of trucks to pass in both directions so it was very slow going on the winding dirt and gravel roads. But as usual there is some beautiful scenery particularly when we passed by a dam with fisheries. We were over 1500 metres at times. Huge entrance to swallow cavern. 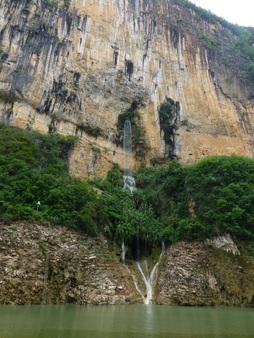 We drive up to swallow cave which is a limestone cave that tens of thousands of swallows nest in. 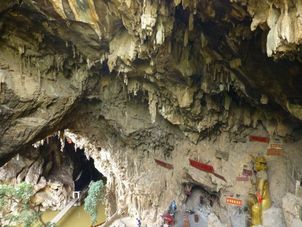 There are many shrines at the entrance and inside the cave. Many cave formations are lit by coloured lights and deep inside the cave there are tourist shops. Most swallows leave the cave at dawn and return at dusk, so not many when we were there. 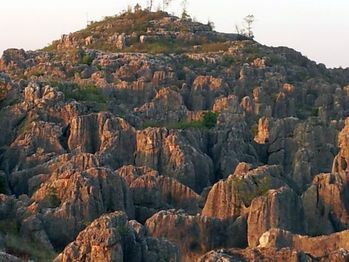 Shillin where there is a stone forest, many granite stones jutting out of the ground up to 30 metres, was our next destination. We camped in the carpark with a view over our on mini stone forest. 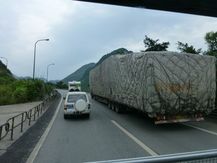 Today is a quick drive on a good tollway to the regional capital of Kunming where we will have our first rest day. 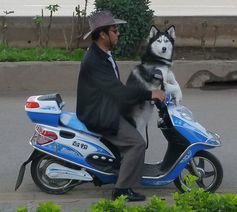 Kunming has 2 ring roads, one on top of the other. We are over the 2.5 metre height for the upper ring road so slog it with the trucks and buses down below. Driving through the city was difficult for 5 vehicles to stay together but we made it to our campsite which once again was a carpark. This time for a minority village tourist attraction. But not so nice this time - hot asphalt and minimal water in the toilets and of course all the curious onlookers who do not understand about personal space. 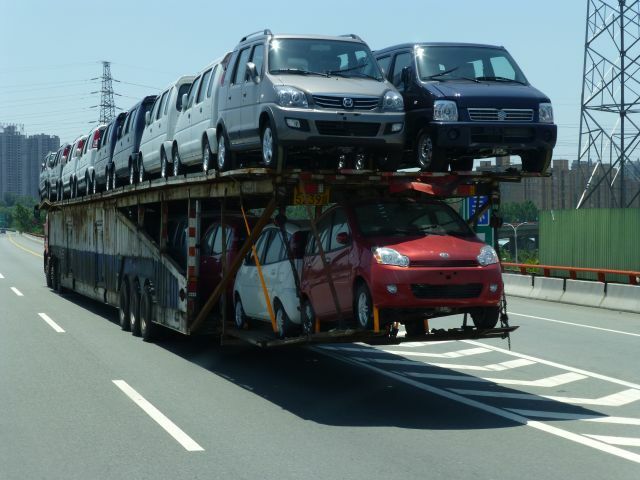 Car carrier plus with Chinese 4WD on board. 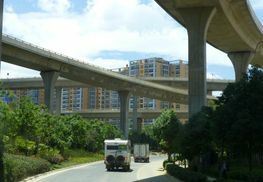 Spaghetti road junctions and the upper and lower ring roads in Kunming. Although the shopping was ok as we all spent too much at a huge European bulk supermarket, the conditions where we were staying were not good. So we only stayed 2 nights. Couldn't find strong enough internet to do website either. 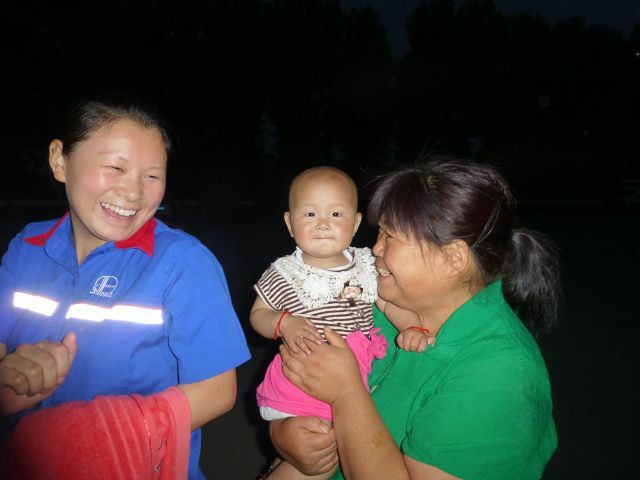 But Robyn, Marina and I decided to go to the Minorities Village which gave examples of villages of more than 20 of the minority groups in China. Some were better than others but it was touristy. My favourite were the Wa minority with their head swinging dancing. 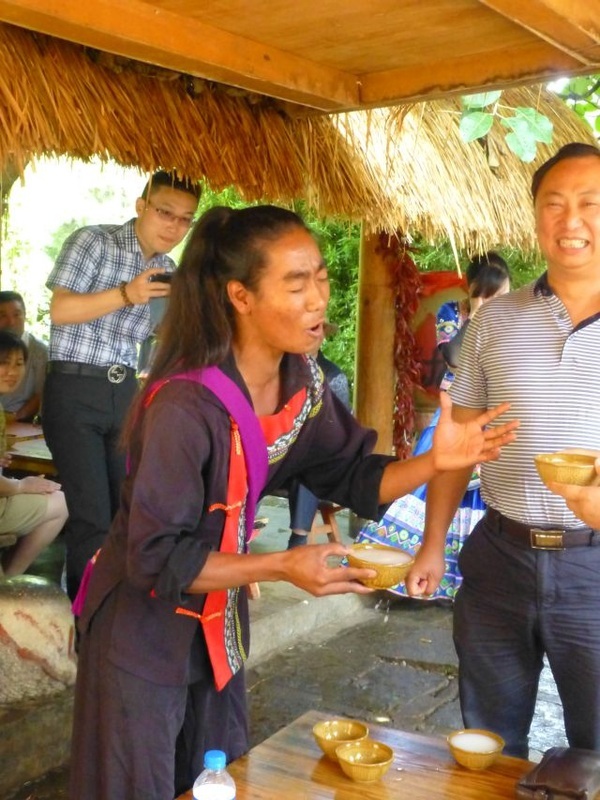 Rice wine ceremony of the Wa seemed like a lot of fun. Wa dancers in minority village. 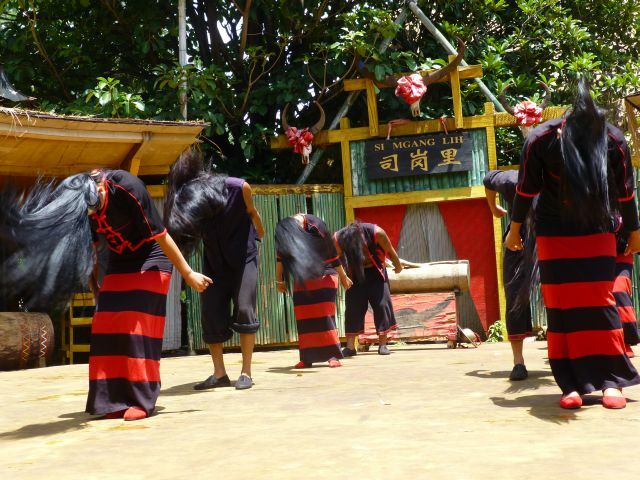 Head swinging, a feature of Wa dancing. 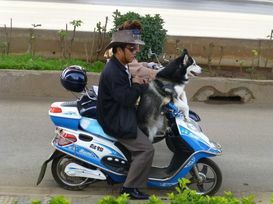 After watching this dog while refuelling we drove west and then south to Midu. The west drive was on a tollway and pleasantly fast. It cost about 90 yuan ($15) and was worth every bit for the hours of motorway driving. We stopped off at Dinosaur Valley to see where one of the largest number of dinosaur fossils had been found. Excellent display but a shame about the attached theme park. I'm off on my Saturday morning drive. Your lady friend has arrived now, so let's go! Spring fed pool complete with fish in Natural Bridge Park. We drove further west on to Natural Bridge Park and camped in the compound where the park attendants live. They were very kind offering us food and water. It cost us nothing to stay there. I offered to show one older lady through the truck which opened the floodgates to many more, even locals on their evening walk. Temple attendant and a giant! We gave our 50c entrance fee to this happy man. 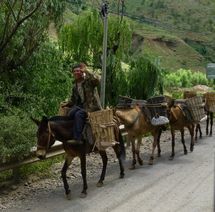 We saw mules/asses carrying loads as we drove south through some dry hilly countryside, quite different to what we had seen. Large brick and painted houses were also peculiar to the area. 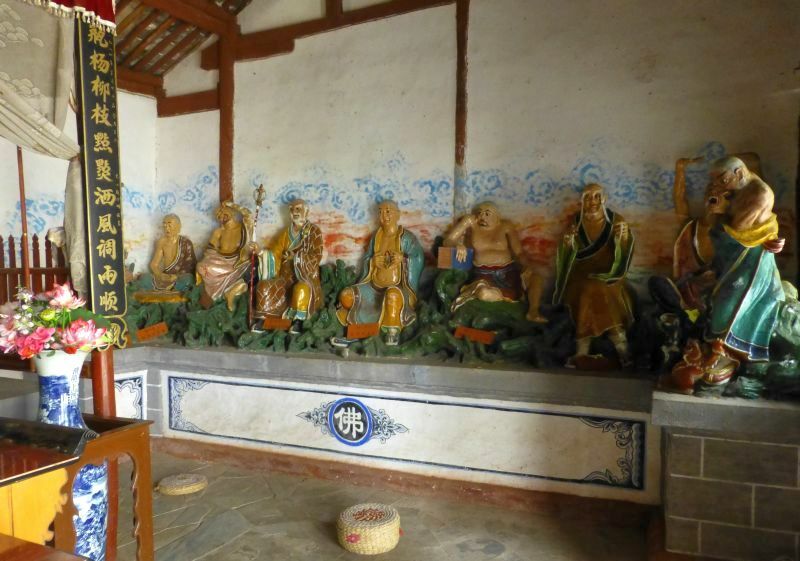 Stopped at Weishan to see the temple which had some interesting statues. What do you want for lunch - everything from yabbies to roses to mushrooms! 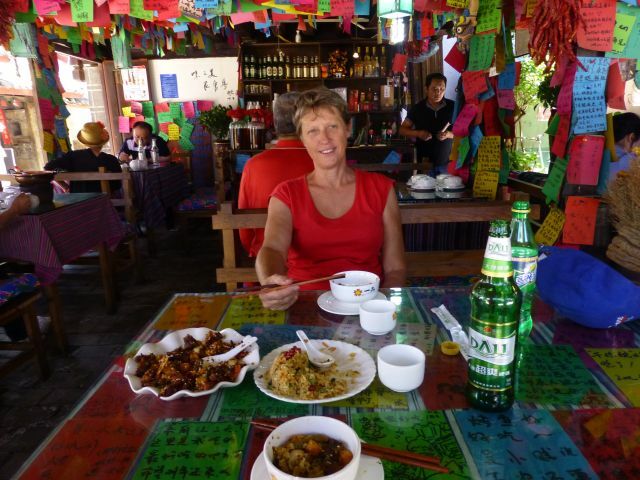 Drove to old Dali where the group had lunch together after choosing the ingredients we wanted from those advertised on the footpath. Stayed in a guesthouse with intermittent fast internet access at night. The Beetrax site seems to be blocked but I was able to access the working site to add the initial China information. Did some washing and lazed around as I am getting over a cold before wandering through old Dali and having a yak steak. 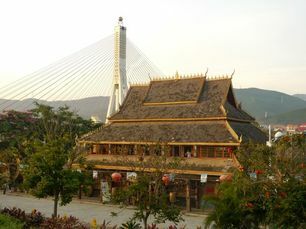 Old Dali is a walled old town which is interesting to wander around and a popular Chinese tourist destination. There is a huge lake nearby with picturesque rice paddies and a high mountain range behind. Very scenic which the fine weather highlighted. 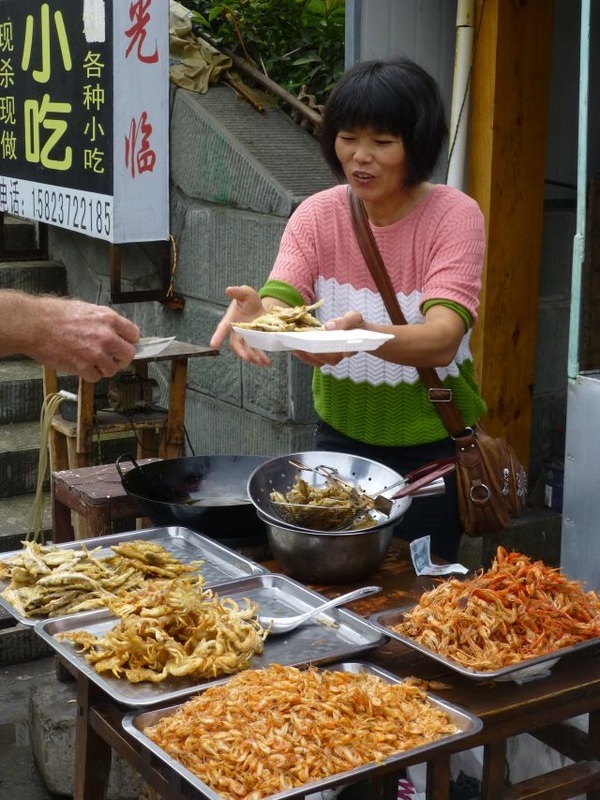 We enjoyed a cable car ride up the mountains and also an interesting market just north of old Dali. Great hat and elegant woman. 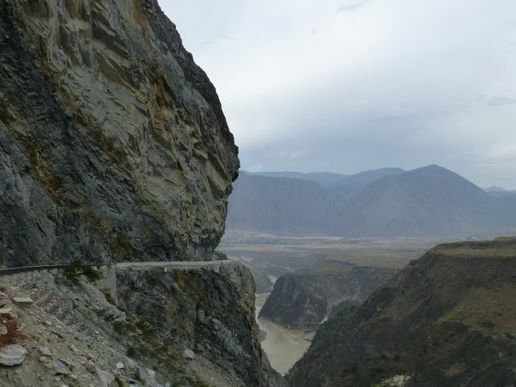 Scenic drive but a bit of roadwork on our way to Tiger Leaping Gorge. 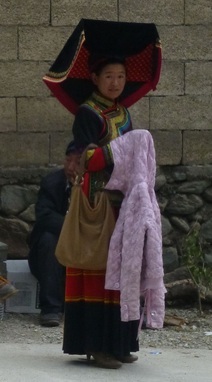 I saw an amazing hat worn by a woman in traditional dress at a bus stop just prior to entering Tiger Leaping Gorge. We saw snow for the first time as we approached the gorge entrance. 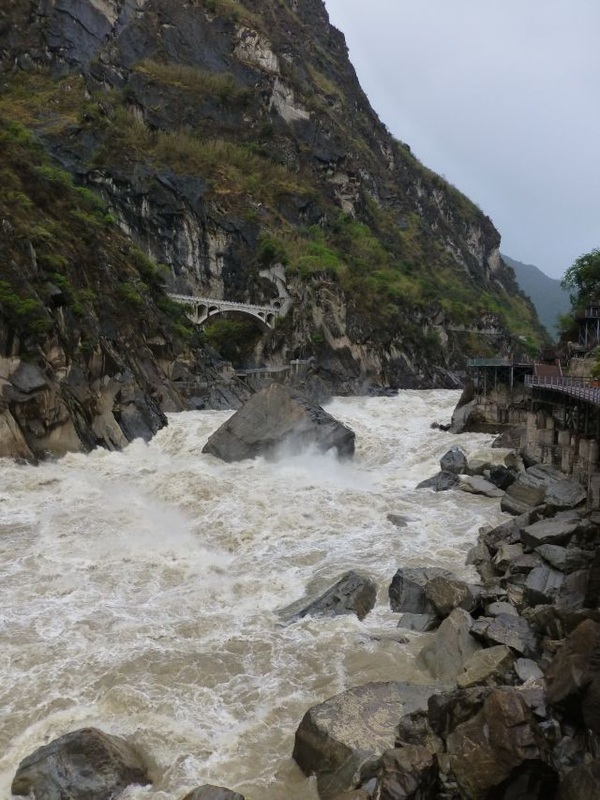 Paid 85 yuan ($14) each to get in and drove to the upper gorge which has good facilities including 599 steps down to the gorge. 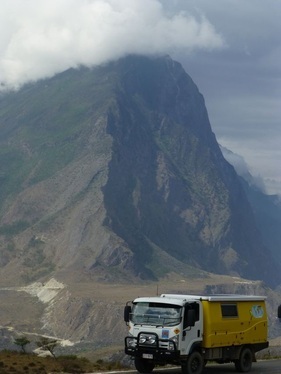 Trucks at Tiger Leaping Gorge entrance. It started to rain and we decided to camp in the carpark. Just on dusk we were moved on as there was a high probability of rockfalls with the rain. We actually saw a rockfall as we drove 10kms onto the next gorge which was not developed at all and safer. Much cooler and me comfortable at night. 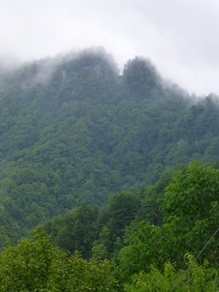 We walked down towards middle gorge but the altitude (2200m) and our laziness from sitting in the truck saw us puffed pretty quickly. Had to relax and enjoy the view of snow capped mountains for the rest of the day. One of the trucks half way along the road on the left. Legend has it - that the rock in the middle is where the tiger leapt to the other side from. 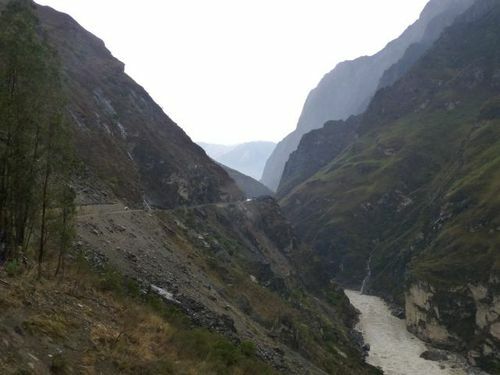 Drove out of Tiger Leaping Gorge as it widened into a big quarry looking valley. Great scenery. 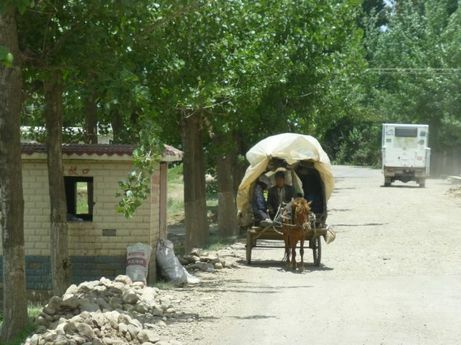 We drove through a village where we decided to stop to buy some fruit and vegetables from the market. Quite a few women were wearing traditional dress which was stunning. 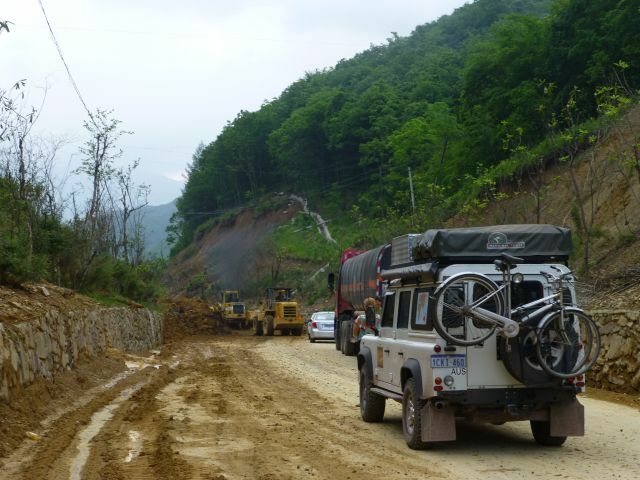 Then there was the traffic jam caused by the narrow road with vertical sides, parked vehicles and a large oncoming truck, before we could drive on to the limestone deposit terraces at Baishuitai. 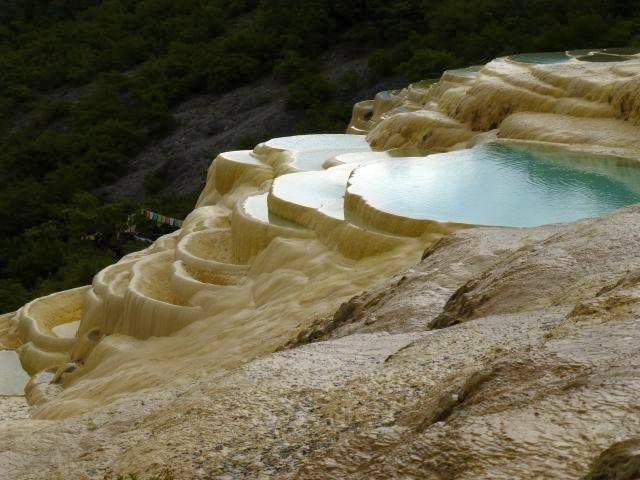 Clear waters of the limestone deposit terraces at Baishuitai. 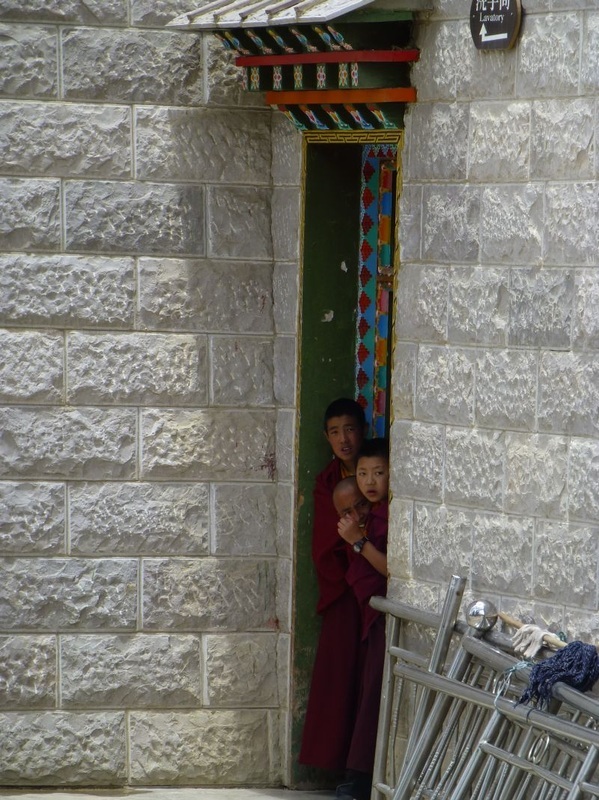 Climbed through high terrain, up to 3720m (over 12,000'), and saw many pink and white rhododendrons and azaleas flowering on the mountainside, then down onto the plain complete with Tibetan style villages and yaks. 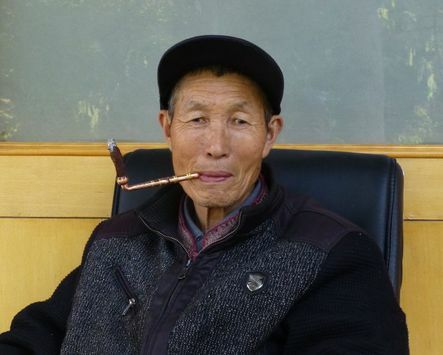 Arrived in Zhongdian or Shangri-la as it was called in James Hilton's book Lost Horizon. Our Chinese guide said that many Chinese do not consider this area as a part of a China because it is so Tibetan. 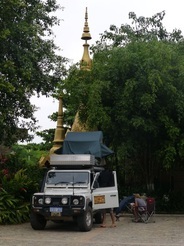 Camped in the carpark of the old town which was noisy with lots of onlookers and no toilets. Saturday night in Shangri-la. Great weather. 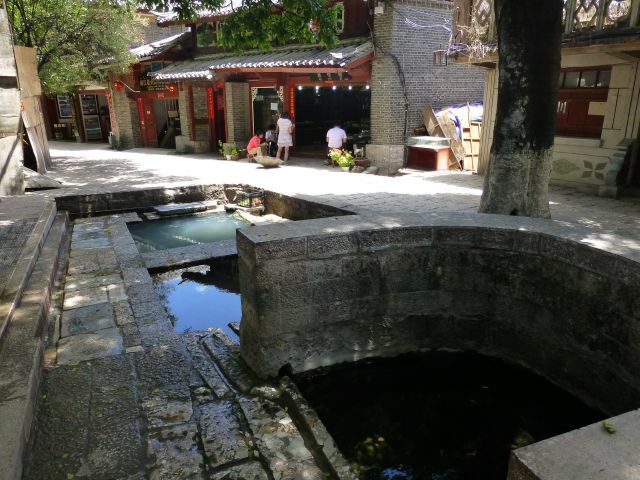 Looked around Zhongdian before catching a bus to the large Buddhist monastery out of town. 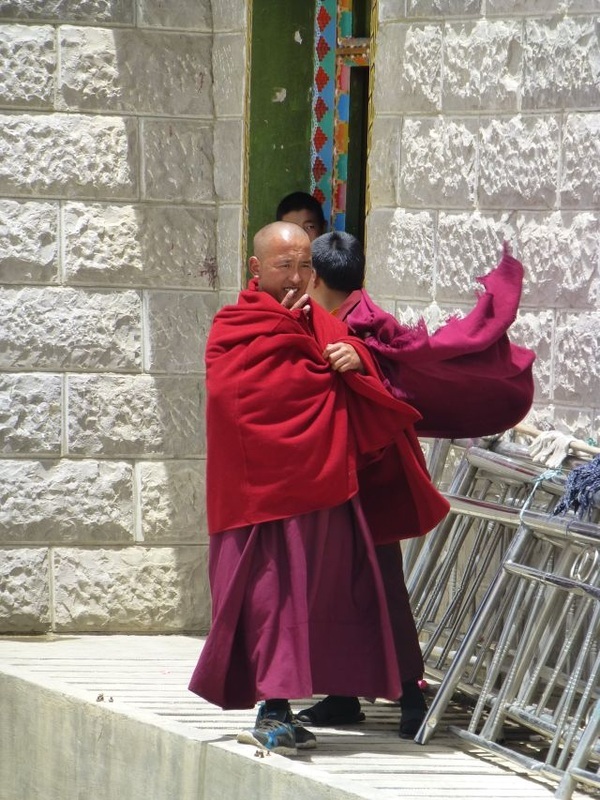 Interesting bus ride and an amazing monastery in a fantastic setting. Then big boss appears and moves away. 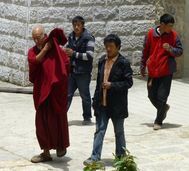 Then young monks come out from hiding. 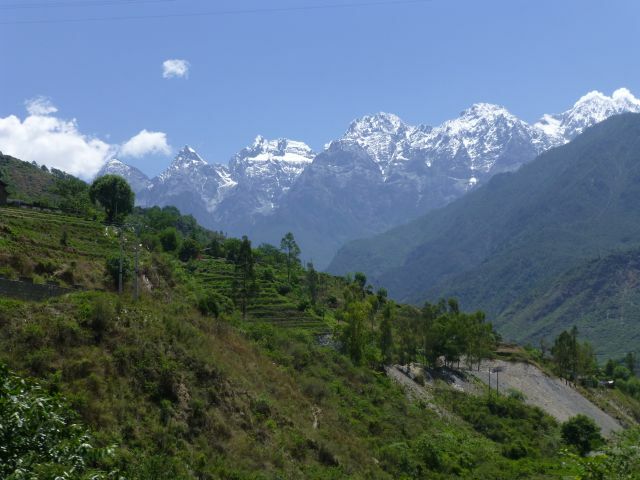 Stunning weather which highlighted the brilliant mountain scenery we drove through on our way to Leijing. 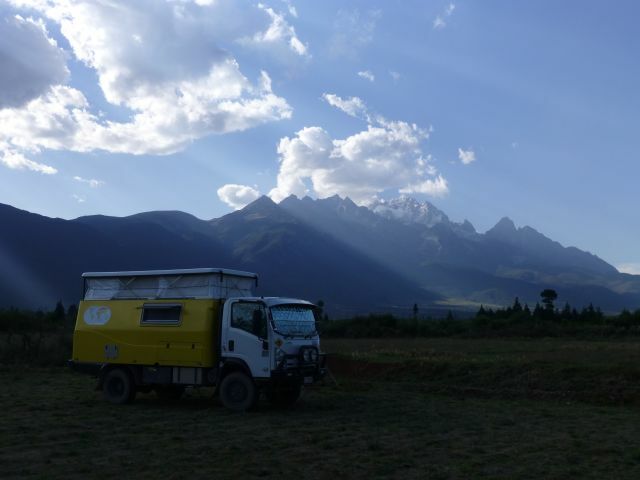 Camped in a field a few kms north of Leijing with the mountains as a beautiful backdrop. 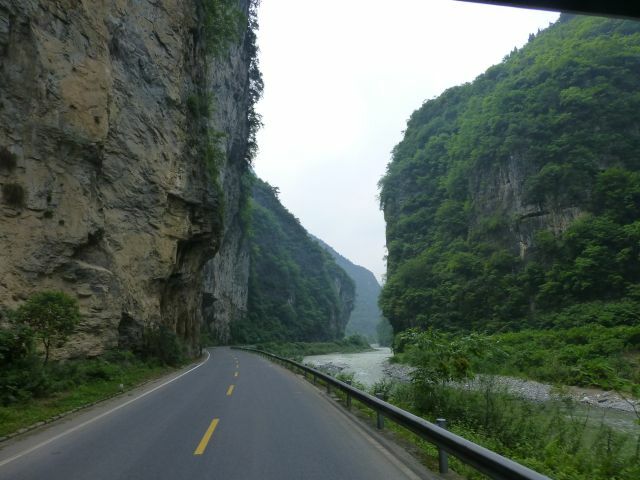 Stunning scenery on our drive through to Leijing. 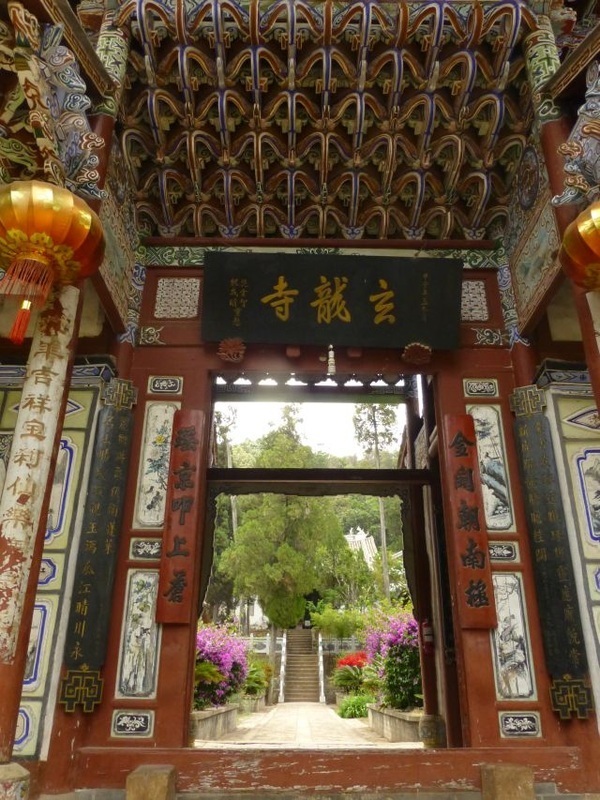 Spent the day wandering around Leijing. Spring fed well at the top used for drinking water which drains into 2nd pool used for washing vegetables and then it drains into the last pool which is used for washing clothes. Lots of winding mountain roads but the roads were sealed and two lanes wide. Once again the scenery was good everywhere we looked. 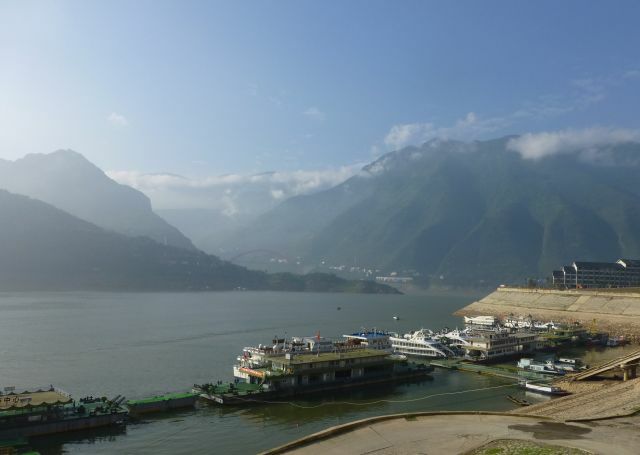 Breathtaking to finally crest and see Lugu Lake. Epensive to get in though – 100 yuan ($17) each. We camped by the lake only a few metres from the water. 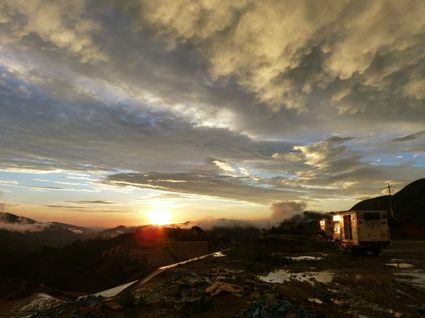 Rest days in Lugu Lake with some truck maintenance. 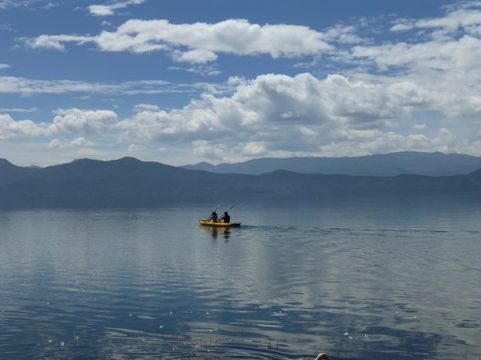 Jon and Jude paddling out on Lugu Lake. I mistook the small white flowers on the lake for styrofoam at first. 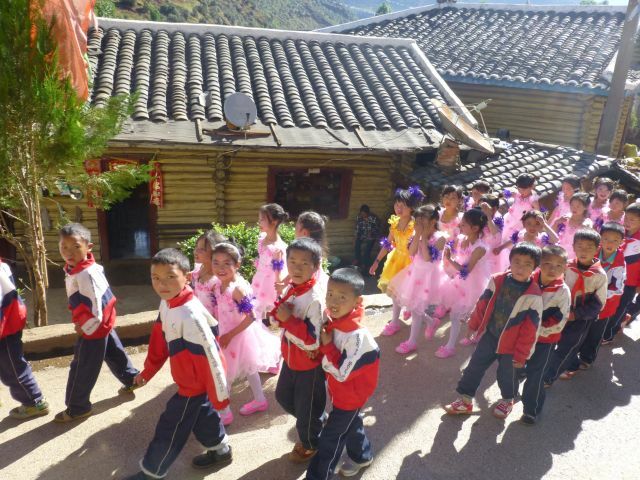 Departed Lugu Lake and noticed many people going to the schools. 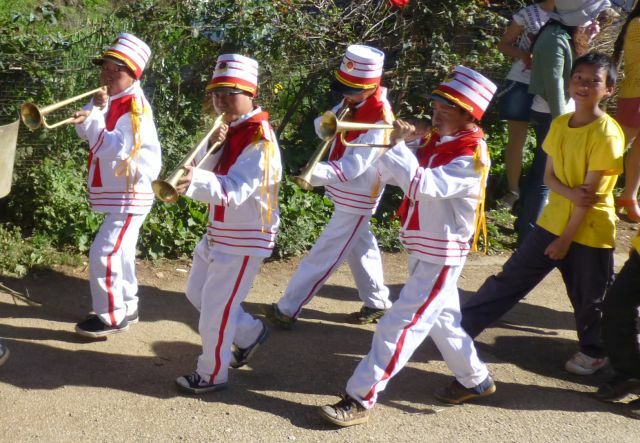 Then we passed a procession of children marching for Childrens Day our guide told us. Shy girl in pink in the middle of the march. 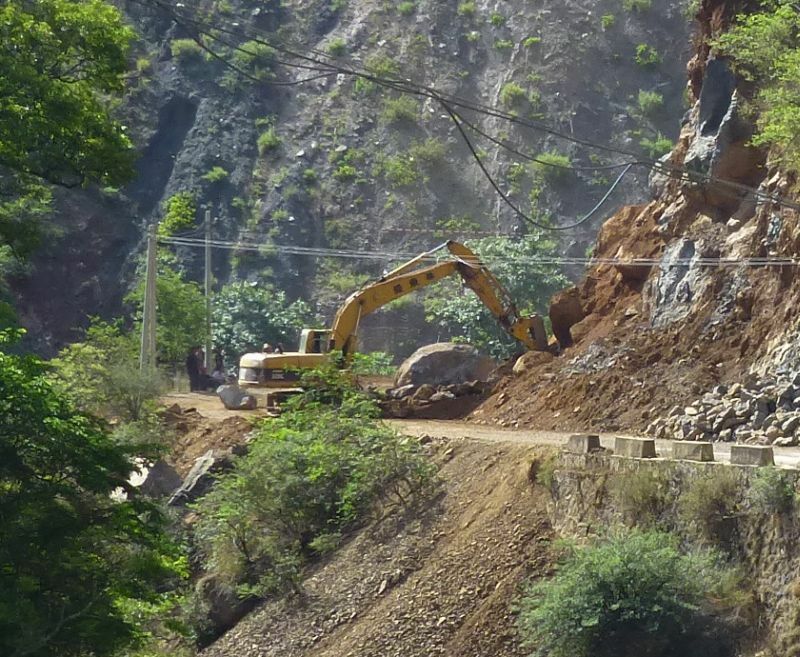 Quite a bit of road repairs and hold ups to remove rock slides. 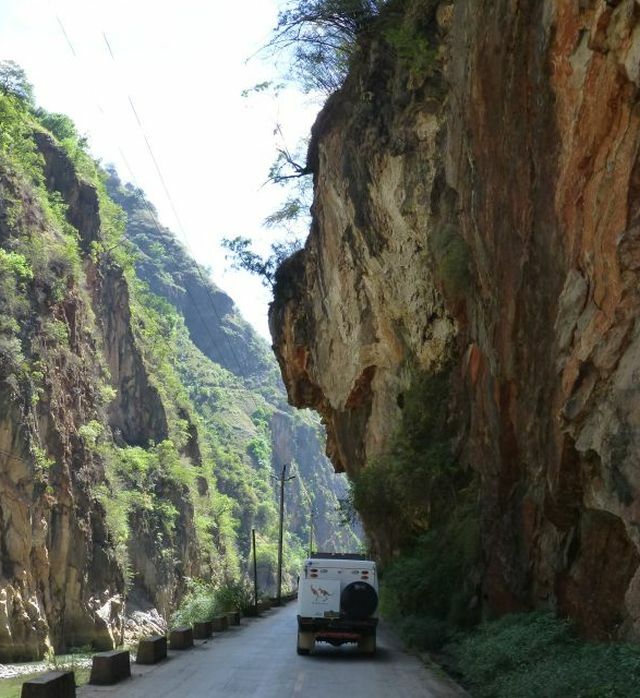 Then some very bad rocky and potholed roads but then we climbed on those winding roads again and more great scenery. Thankfully I am not tiring of the scenery. Who wants to drive under that. Village incinerator, cart and Miles' truck, Roadie. Tollway day through lots of tunnels and high bridges narrowing to one lane at times and beautiful mountain scenery marred by smog and some bigger towns and factories in the valleys. We had wanted to go to a Reserve further north but we were informed that it was closed. So we turned early at Ya'an where we had lunch and looked at damage from the earthquake a couple of months ago. 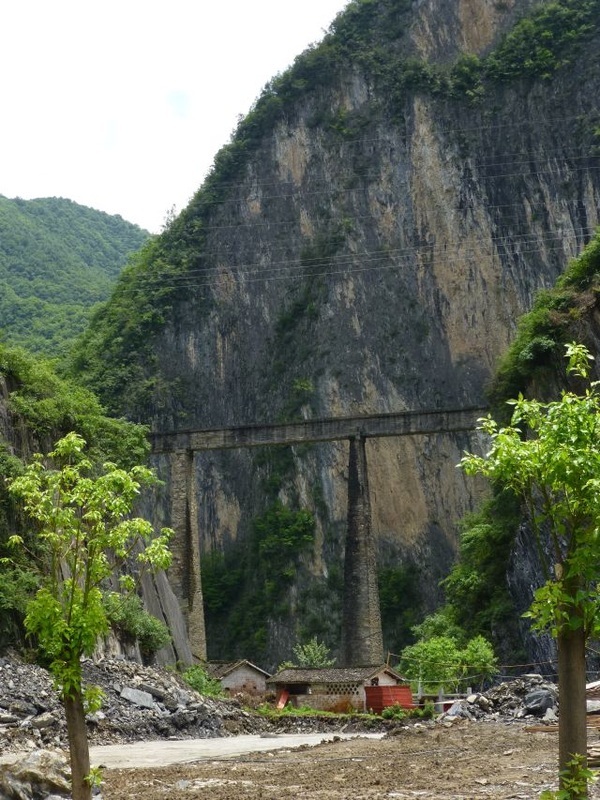 We travelled on minor roads through to Emeishan. A beautiful clear day so we decided to hang the expense ($130) for the 2 of us to get to Jinding Temple at over 3000m. We left early for the 2 hour bus ride up the mountain followed by a 1km walk and then a cable car ride. After queuing for 30 minutes we had an interesting cable car ride, jammed in with 40 Chinese people. They are not quiet and the piped music in the cable car was loud too. Thankfully it was a quick ride. We decided to walk down to the bus after looking at the temple and the view. We passed several men and women carrying huge loads of sand in baskets on their backs going down the stairs also. We have noticed that many jobs are done manually. Cheap labour I suppose. 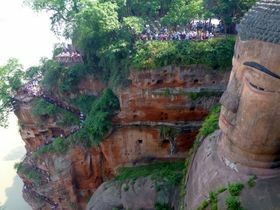 First of all Leshan and the giant Buddha carved in the rock 1200 years ago, a UNESCO World Heritage site. I walked to it and then did the cruise passed it. 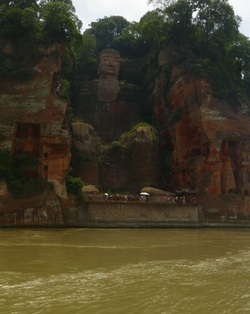 Giant buddha built to calm the waters of merging rivers. Giant Buddha carved 1200 years ago. 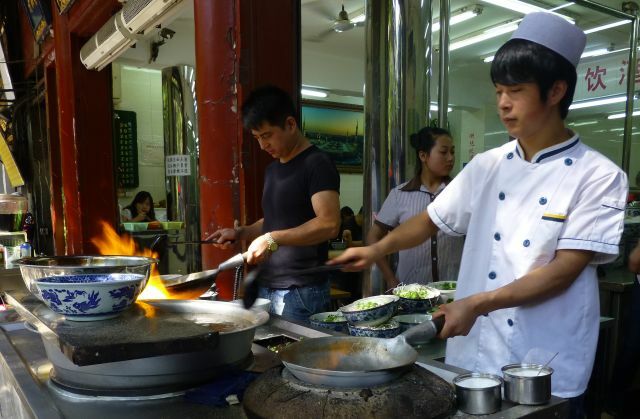 Chengdu is a large city and we had a motel which included breakfast for 2 nights. I wouldn't recommend Chinese breakfast. Stripping the bamboo and the eating the inside. Off to see the pandas early before they fall asleep after being fed. Arrived to find the adult pandas had just been fed and were starting to feel tired and lethargic whereas the cubs were full of slow motion energy and play. Great to watch. We spent most time at the cub enclosures. 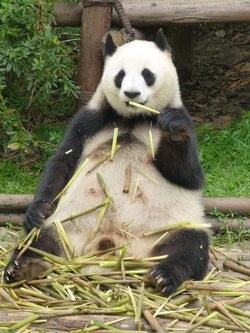 After a couple of hours we went up to see the red pandas – no relation but they do eat bamboo too. Good coffee for the first time in months. 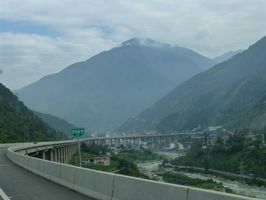 Travel day from Chengdu to as far as possible towards Wushan on the expressway. 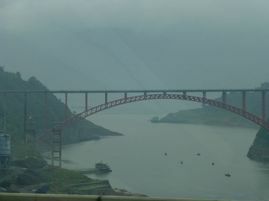 We went just over 500kms to Wanzhou, stopping at a new expressway servo that even had free internet and showers. Finished the tollway run at Fengjie at a total cost of 183 yuan ($30). 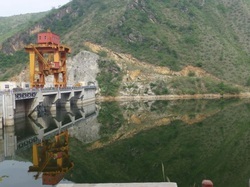 Fengjie was flooded by the 3 gorges project and rebuilt further up the mountain. However there was a temple that still remains on an island. Unfortunately the cost to see it was $20 which did not balance our desire to see yet another temple. Tollways and entrances are very expensive here. Tasty . . . but oily . . . battered sardines. Those quick release pants again . . . but what if . . . 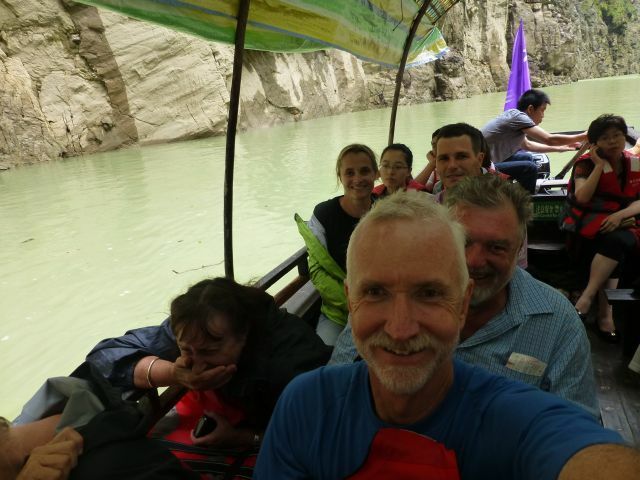 Drove on to Wushan where we did a boat trip of the 3 smaller gorges of the Daning River which lasted about 4 hours and included changing to a smaller boat for a 40 minute trip where the gorge was narrower.Saw a hanging coffin over 100m up the cliff face. The coffins are up to 1000 years old and sit on pegs hammered into the back of the cave they are in. Don't know how they got them up there. 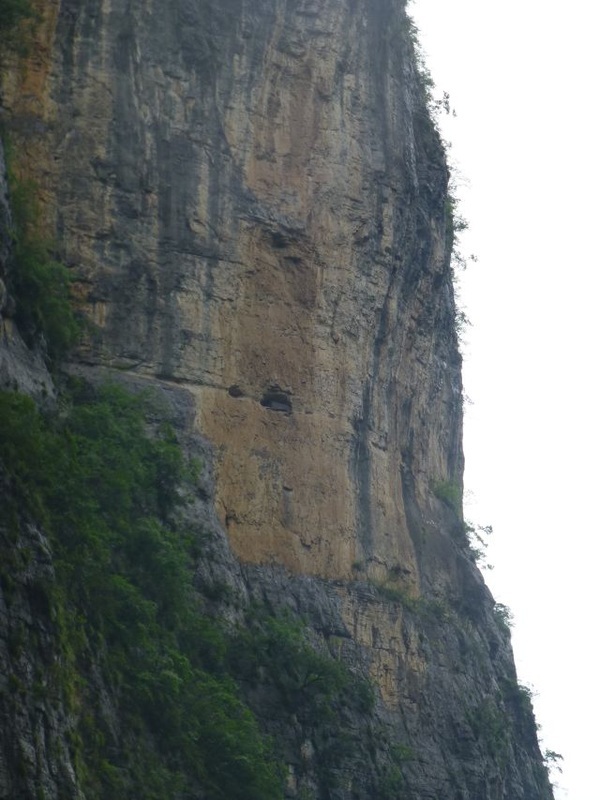 Hanging coffin 100m up the cliff in the middle of the photo. 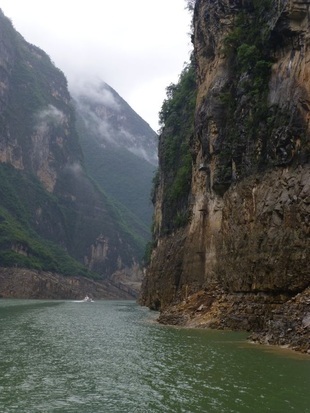 Three Small Gorges cruise. Robyn is quite well just in fits of laughter as the guide did not shut up. 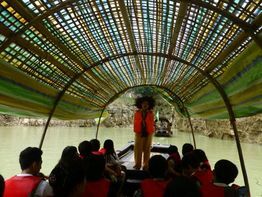 Our guide on the Small Gorges cruise did not stop talking or singing for the whole 40 minutes. Returned around 6pm and then 2 dance classes started....either side of us! The music clashed and of course all the onlookers as well made it rather unpleasant. Adding to the noise a guy was cracking a whip at a top to keep it spinning. Awoken at 5.45am to the slapping of sticks as the dancing and their music started AGAIN. They were literally right outside our window. 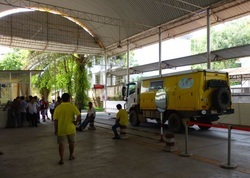 Then a competing lot started in front of the truck with their music. 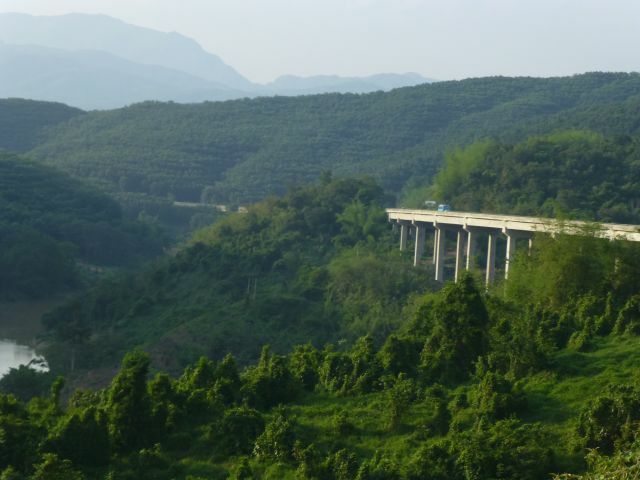 Ventured onto the last bit of expressway before more winding mountain roads towards Shennongjie National Park. Had to wait for a landslide to be cleared at the top of the mountain before finally finding a campsite just over the hill. 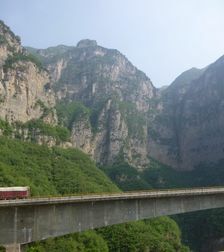 Tollway growing out of the mountain. Road into the National Park. Hold up to clear a recent landslide. We walked to the information centre. As usual there was nothing in English and no one spoke English. So we watched a few birds and spent the rest of the day relaxing at our campsite. And then on Sunday it rained all day with temperatures only getting to 16C. Happy to have another day sleeping and reading in the forest surroundings. Heaven's Gate is the name of the gap between those 2 peaks. 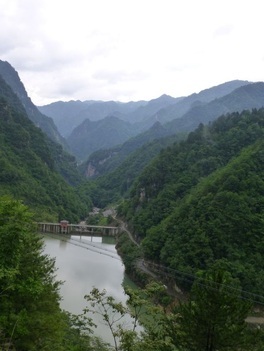 We took the winding road through the enormous Shennongjie National Park as the clouds floated by. There were a couple of peaks with bridges between them, including the one on the right. We walked across the more modern bridge between two cliffs nearby. Looks quiet but a busload of Chinese tourists arrived as we did. 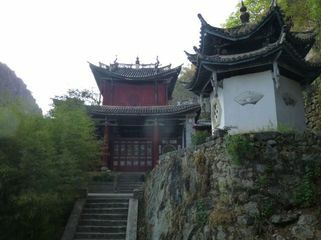 Enjoyed our mountain stay but we had to get to Shiyan and then Xi'an. Very tall aquaduct we drove under. 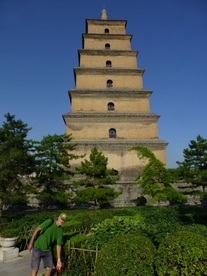 Guy smelling the roses at the Wild Goose Pagoda. 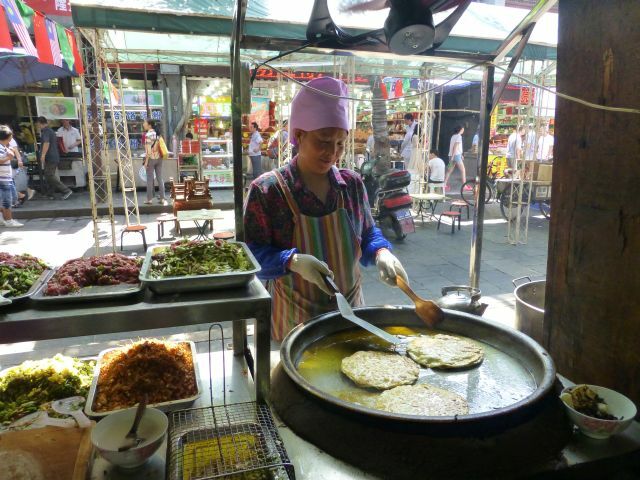 Highway driving up to Xi'an where we saw the 1300 year old Wild Goose Pagoda and inside the city wall the Muslim sector which was interesting and full of life. 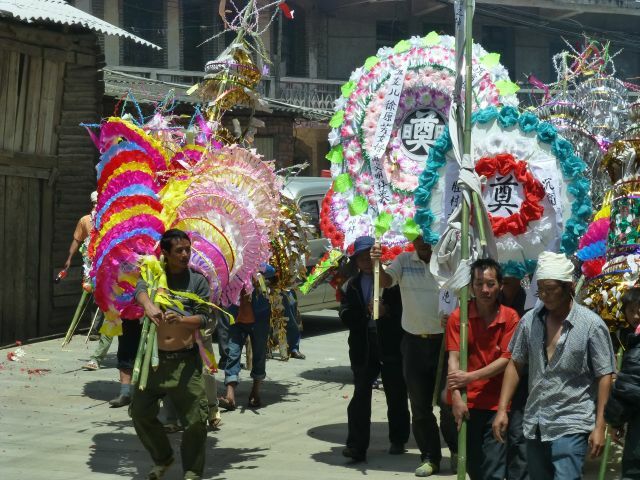 It is the dragon boat festival time when they celebrate the drowning suicide of a poet more than two thousand years ago. We drove out to Emporer Jingdi's tomb before going on to the terra cotta warriors to camp for the night and to get in early before the crowds. 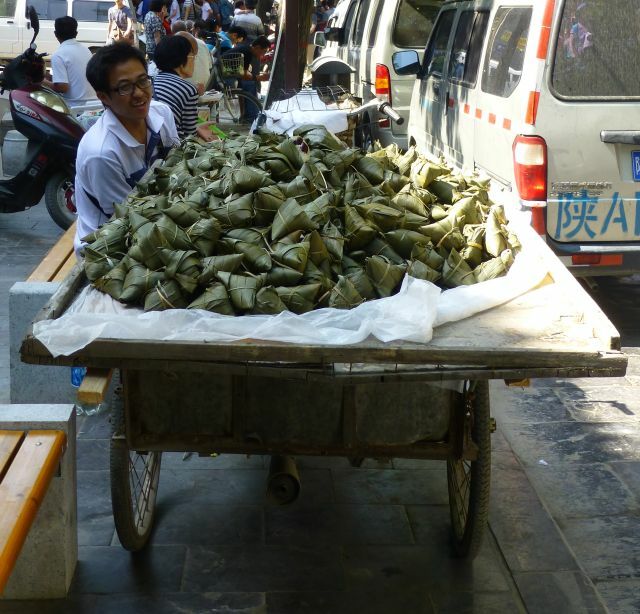 Dragon boat treats of sticky rice with red beans in those leaf packages. Cooking in the Muslim sector. 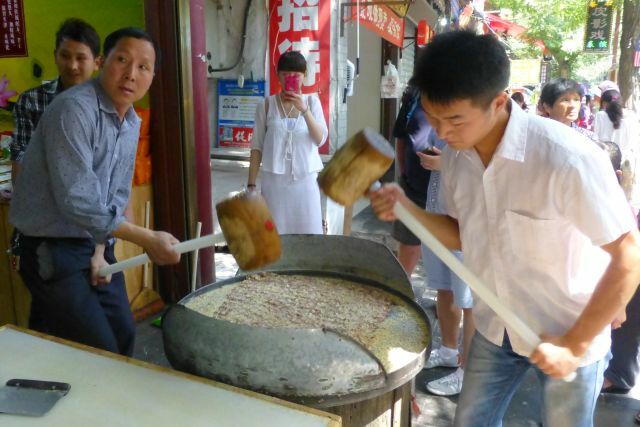 Hammering a kind of peanut brittle prior to packaging and selling it...to me. 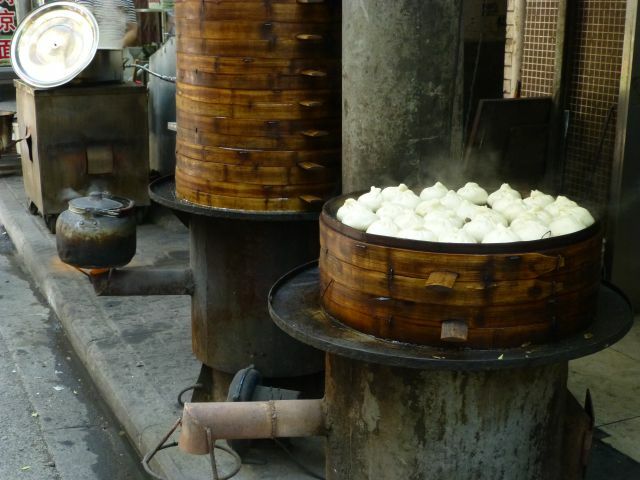 The kettle is hot and the dumplings are ready. The terra cotta warriors from around 240 BC. It paid off getting in early and sharing the cost of a guide. Very impressive and I was surprised to learn that the clothing of the warriors was originally quite bright. To me they look a lot more imposing in their earthy tones. There is still years of digging and restoration to do. They have not started on the main tomb of Qin Shi Huang yet as it is under a water table and surrounded by mercury. Further research is required to ensure no damage is done when it is exposed to air etc. 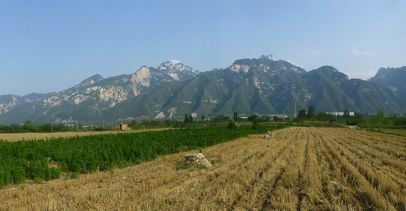 View of Hua Shan from our campsite. 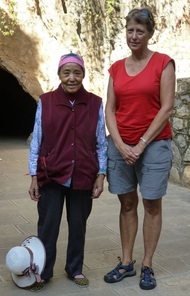 After the impressive warriors we drove up to Hua Shan, a sacred Buddhist mountain for our next treat. We decided to catch the cable car up to West Peak and then walk down to North Peak to catch the other cable car down. Great strategy. Expensive to enter the park and for the cable car but the ride was the best I have ever been on. Comforting to know that it was Austrian as it was over 4 kms long, passing over sheer cliffs and climbing steeply. Stunning scenery the whole time. 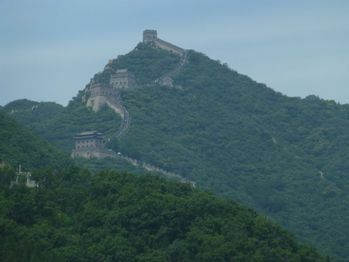 Left Hua Shan for the Longmen Grottoes near Luoyang and then north on the tollways towards Pingyao. 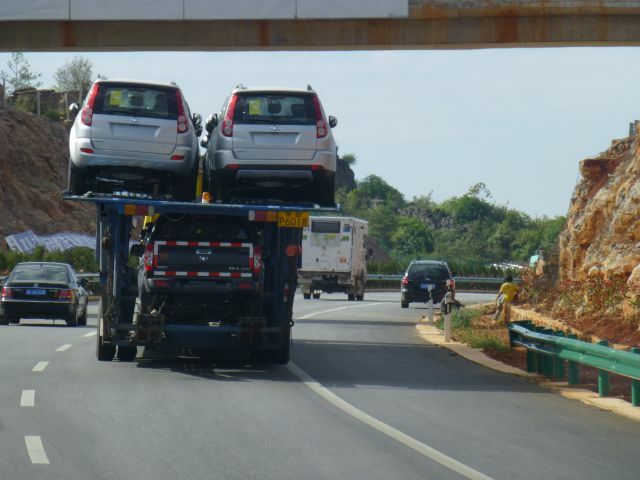 How many cars can a car carrier carry? Guy and other truckies, some fond of showing their bellies. .... and on the right side of the tollway! Arrived in Pingyao, the best preserved old city in China and yet another UNESCO World Heritage Site, to stay for a couple of nights. 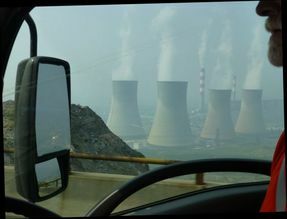 We are starting to hit a bit of the smog of the industrialized central China now. 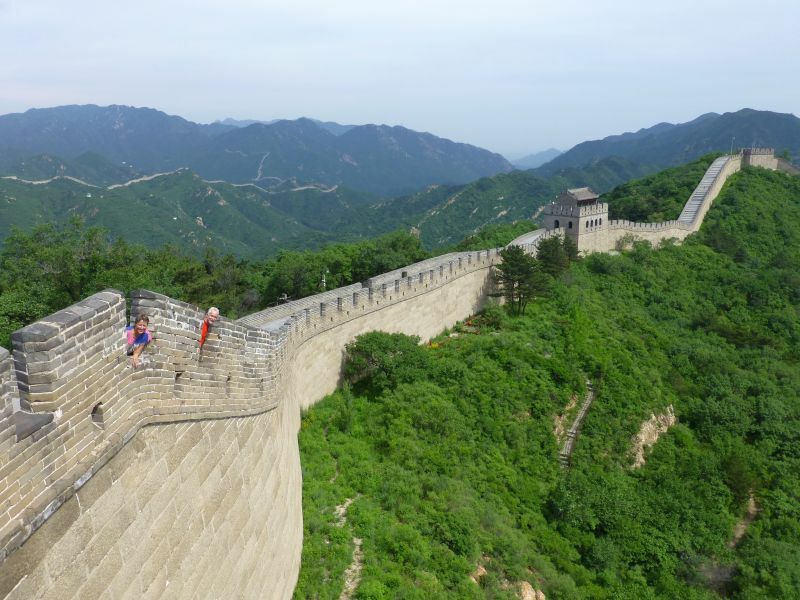 The days are starting to fly by as we travel north towards Datong which has some interesting sights including a hanging monastery, grottoes and unrestored parts of the Great Wall of China. It's all highway driving so not as many trucks but there are some crazy car drivers weaving through at speed. A bit more of the wall....it,s Guy in there. 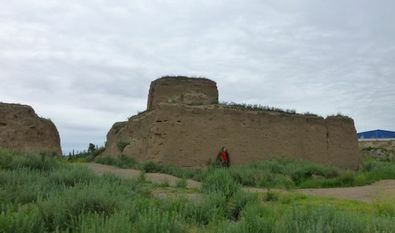 We left the village north of Datong with its pieces of unrestored Wall and set off to look for some more parts of the Wall on our way to Beijing. We found some about an hours drive away. Camped about 150 kms from Beijing. 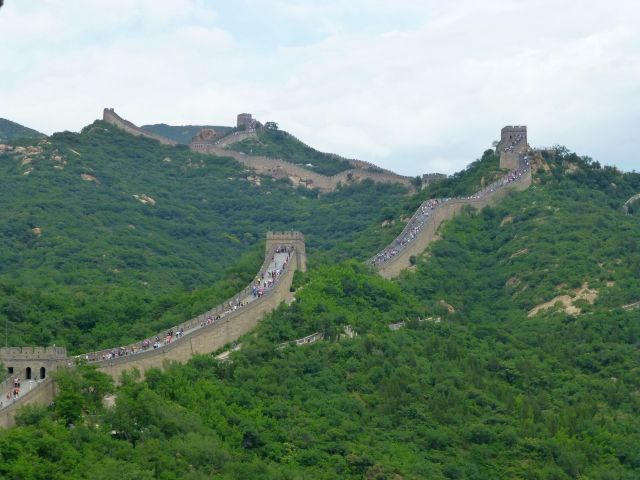 Our first glimpse of the Great Wall was from the tollway on the way into Changping where we would leave the trucks and spare the drivers the traffic of Beijing. Quite a length of it has been restored and was pretty impressive. You can see the wall on the ridge lines. It is very steep in parts. Guy and I on the Badaling stretch of the Great Wall of China. We left the Bee and took the train into Beijing where we stayed for 3 nights and 4 days of sightseeing, Peking Duck and other experiences. Guy was approached by women in pairs several times, all wanting to take him for coffee or to tea ceremonies so they said - a scam. 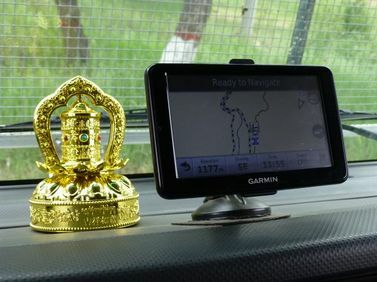 A must for safe passage through China - solar powered prayer wheel and a GPS. 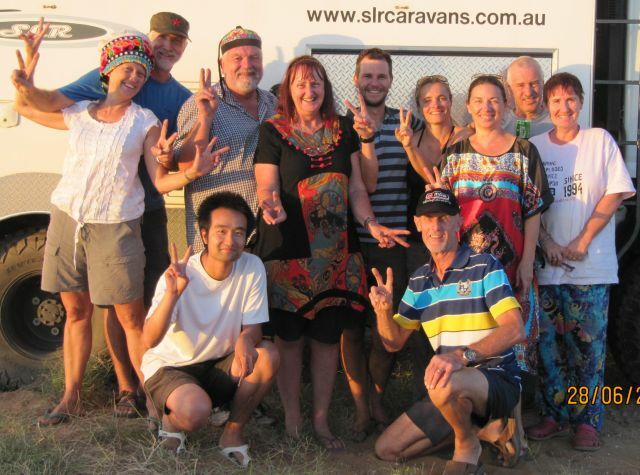 We returned to Changping and Bee to prepared to travel on to Mongolia, stocking up on food, fuel and water. A two day drive towards Erenhot on the Chinese side of the border with Mongolia. The last part on open plains with lots of windfarms. We decided we would all like to leave a day early and so the paperwork was set in motion and the party was on for our last night in China. Dinosaur gate crashers at our party. 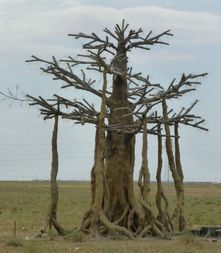 Some living ancient trees amongst the dinosaurs. 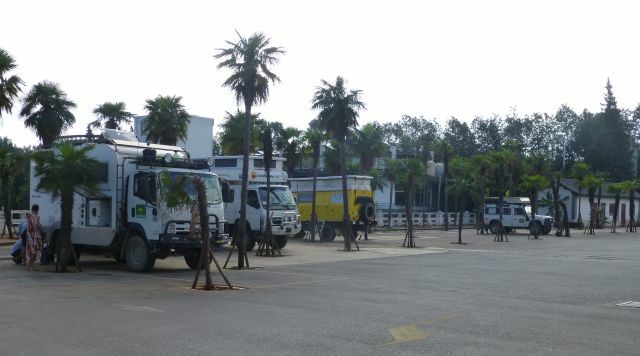 The trucks all lined up at the entrance to the border town of Erenhot. 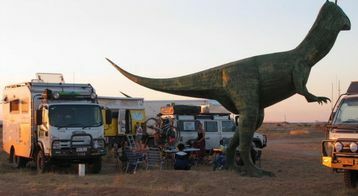 We camped near the dinosaurs and waited for the phone call to say our paperwork was ready and we could leave China. The call came just before 4.00pm.